Size: 7.6" x 4.4" x 0.7"
This educational toy for youngsters gave you the features of the Little Professor in a handy plastic case. The inside story of this wonderful Mickey is identical to the Math...To Go! introduced 4 years earlier. In Europe an identical product was sold as MICKEY 123. 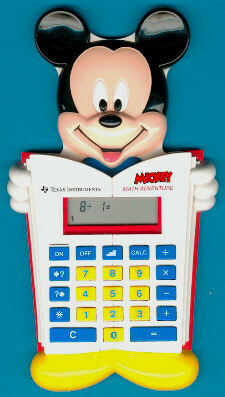 If you like the Mickey Mouse but need only a calculator search here. © Joerg Woerner, March 15, 2002. No reprints without written permission.